To design and create high-quality products that are unique and useful for pet lovers. Our online store offers a wide variety of upscale apparel and unique products for passionate canine, feline, and equine lovers of all ages. Simply put, you will not find merchandise like ours anywhere else. All of THREE DOGZ™ products and apparel designs are original, eye-catching, touched by classic styling, with fashion forward appeal. Our Clean PawZ™ Embroidered Towel Collections are not just beautiful, they are high quality and very practical. They will keep your “furry kid(s)” warm and dry on damp, wet, and snow-filled days plus…keep your floors and furniture clean. Headquartered in Livonia, Michigan THREE DOGZ™ products celebrate the love we ALL feel for our pet(s) each and every day. If you’re like us you have searched for unique one-of-a-kind products for yourself and/or those special pet lovers in your life. In return, you probably enjoy receiving gifts that signify the deep rooted love that you feel for your children with fur. We invite you to come on in, sniff around to see what we have to offer. 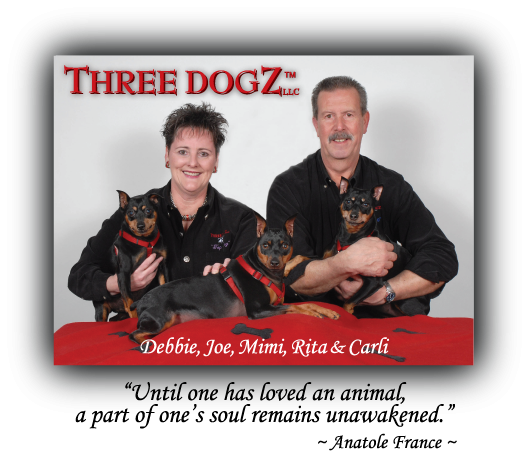 Find out for yourself why THREE DOGZ™ products always make the perfect gift!